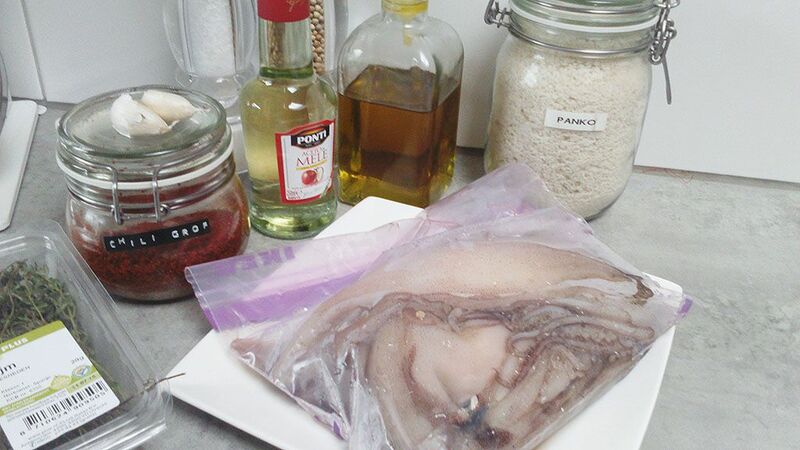 It always sounds kinda scary to clean a squid yourself, but to be honest it’s easier than you might think. CLEAN the squid by slowly pulling the head out of its body, the innards will come out too. You can now save the black squid ink, for example you can use it to color your risotto. PLACE your knife behind the eyes and cut it through. Now you divided the head from the tentacles. Inside the tentacles there’s a little piece you have to remove, that’s its beak. Now you can clean the tail. There’s a hard piece inside, that’s called the cuttlebone. REMOVE the cuttlebone, it looks sort of like a thin piece of glass. PEEL off the skin, it’s easy when you use your fingernail to grab it. Now clean the tentacles and tail under running cold water. SLICE the tail into the desired size rings. 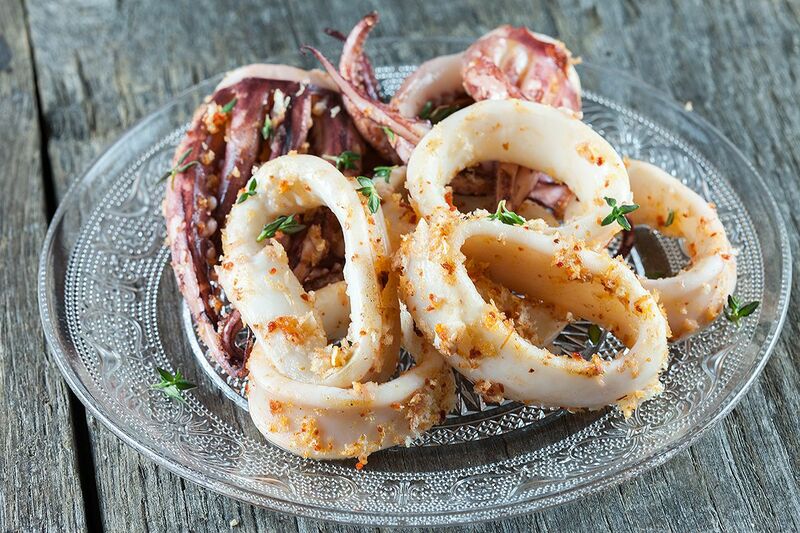 ADD the squid tentacles and rings to a large bowl and add olive oil, apple cider vinegar, pepper and salt. PLACE in the refrigerator to marinate about 1 hour. HEAT a grill pan and add the squid rings, after about 1 minute you can also add the tentacles. Because otherwise the tentacles will become tough, they have to cook a bit shorter than the rings. After grilling the squid for 2 minutes total, transfer them to a bowl and add panko and chili. Throw them back into the grill pan and cook for another minute. 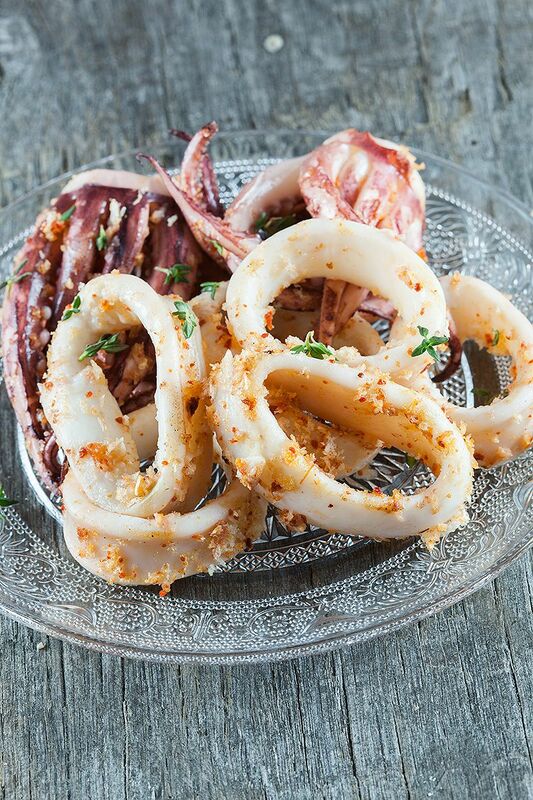 GARNISH with a few thyme leaves and enjoy these lovely marinated squid! 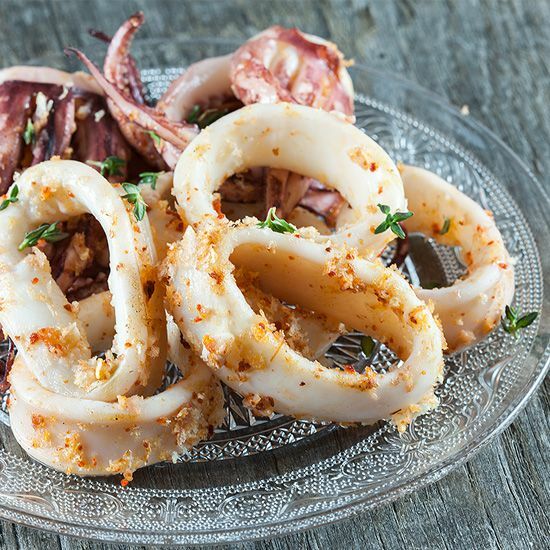 I love most squid preparations and this one sounds like it would be right up my alley. Plus it’s super fast to make too!